Acquisitions by Chinese firms have increased markedly in recent years. So far, we know little about the effects of these acquisitions on the acquirer’s innovation performance. Our paper focuses on two interrelated research questions. First, to what extent can Chinese firms increase their patent output following an acquisition? Second, which factors influence the post-acquisition patent output? 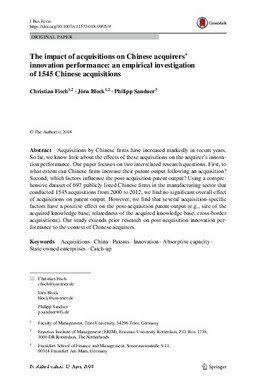 Using a comprehensive dataset of 697 publicly listed Chinese firms in the manufacturing sector that conducted 1545 acquisitions from 2000 to 2012, we find no significant overall effect of acquisitions on patent output. However, we find that several acquisition-specific factors have a positive effect on the post-acquisition patent output (e.g., size of the acquired knowledge base, relatedness of the acquired knowledge base, cross-border acquisitions). Our study extends prior research on post-acquisition innovation performance to the context of Chinese acquirers.